On December 15, Booz Allen Hamilton President and CEO Horacio Rozanski presented Lieutenant General Pete Osman (Ret. 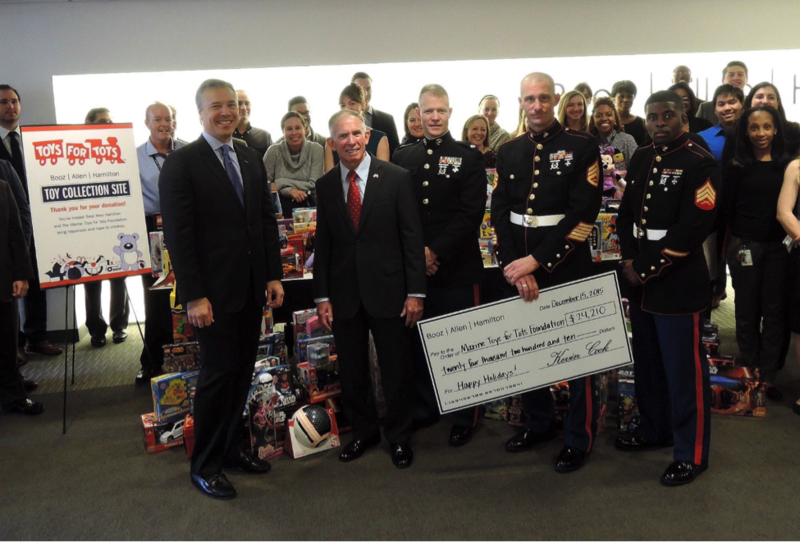 ), President and CEO of the Marine Toys for Tots Foundation, with a check for more than $24,000 and a treasure trove of toys to be distributed to children who might not otherwise receive a gift this holiday season. In one of the firm’s largest employee-led charitable initiatives, Booz Allen employees have so far donated nearly 3,500 toys and raised over $12,000 – an amount the firm has matched. Additional funds raised through December 31 will also be matched by the firm. Since 1991 Booz Allen employees have supported Toys for Tots and other charities that distribute toys to deserving children. This year the firm collected toys at 48 office locations across the country. As a company, Booz Allen Hamilton makes it our mission to solve our client’s toughest challenges. We also apply our experience and expertise to making a difference in our communities. The spirit of service is embedded in our culture, and Booz Allen employees are passionate about giving back. When we sign on to help ease some of the burdens in our communities, we’re helping our neighbors, our employees, and working to create a better environment for all of us. Learn more about Booz Allen’s spirit of service.